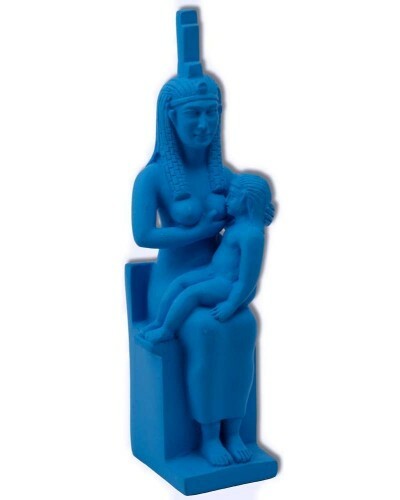 Egyptian Isis nursing Horus statue is in blue faience finish is the ulitmate expression of a Mother's Love. 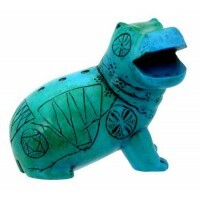 In ancient Egypt, faience was a glazed earthware used for statues and usually with a blue or green/turquoise color. Blue was considered a color of purity. 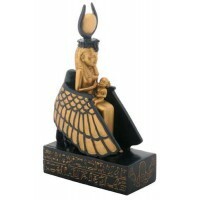 Isis, one of the premier Mother Goddesses of ancient Egypt, is one of the best loved Goddesses in all the world with temples found to her all thru Egypt and Rome. This image of Isis nursing her son, Horus, has been speculated to be the model for later Christian images of the Madonna nursing Christ. 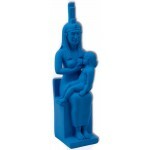 This lovely blue resin statue is 6 1/2 inches high with faience blue finish. Item Number: SS-BIS | Approximate Size (Inches): 3.50 wide x 3.50 deep x 6.50 high | Approximate Shipping Weight: 3.00 lbs.